I. The citizens of Fredericktown being unwilling, while overrun by members of his army, to open their stores, in order to give them confidence, and to secure to officers and men purchasing supplies for benefit of this command, all officers and men of this army are strictly prohibited from visiting Fredericktown except on business, in which case they will bear evidence of this in writing from division commanders. The provost-marshal in Fredericktown will see that his guard rigidly enforces this order. III. The army will resume its march tomorrow, taking the Hagerstown road. 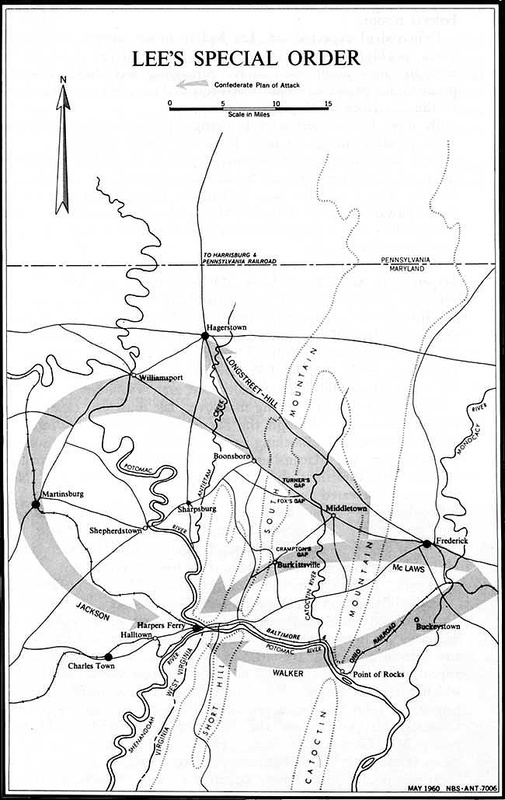 General Jackson's command will form the advance, and, after passing Middletown, with such portion as he may select, take the route toward Sharpsburg, cross the Potomac at the most convenient point, and by Friday morning take possession of the Baltimore and Ohio Railroad, capture such of them as may be at Martinsburg, and intercept such as may attempt to escape from Harper's Ferry. VII. General D. H. Hill's division will form the rear guard of the army, pursuing the road taken by the main body. The reserve artillery, ordnance, and supply trains, &c., will precede General Hill. Sources: Official Records of the Union and Confederate Armies; National Park Service; National Archives and Records Administration; Library of Congress. Recommended Reading: The Civil War Battlefield Guide: The Definitive Guide, Completely Revised, with New Maps and More Than 300 Additional Battles (Second Edition) (Hardcover). Description: This new edition of the definitive guide to Civil War battlefields is really a completely new book. While the first edition covered 60 major battlefields, from Fort Sumter to Appomattox, the second covers all of the 384 designated as the "principal battlefields" in the American Civil War Sites Advisory Commission Report. Continued below.